If you’re going to plan a bathroom remodel, you want to make sure you plan the right one. If you don’t choose the right details for your space, you could find yourself redesigning your bathroom again sooner than you’d like. A remodel really can last a lifetime, as long as you create a timeless tub with modern details. It’s easier than you think too, especially with the bathroom remodeling options available today. The very best way to get the most time out of your new bathroom is to make sure you choose the right tub and shower color. Avoid trendy colors that can go out of style quickly. Instead, choose a neutral color, like white, cream, or tan. You have an important choice to make when it comes to the tub or shower surround too. Choose acrylic for easy maintenance, but choose acrylic that’s printed to look like natural materials. Marble, granite, and slate are just a few of the styles you can choose. There are patterns you can choose from too! Subway tiles and diamond tiles will never go out of style, while modern geometric patterns will likely go out of style in a few short years. Walk-in tubs pose a unique problem when it comes to creating a modern, stylish space. That’s because they look so different from traditional tubs and showers. Fortunately, that doesn’t mean your tub is doomed to look like an eyesore! As mentioned above, the best thing you can do for your space is choose neutral colors, patterns, and styles. 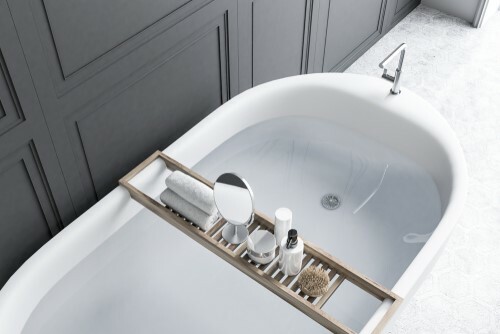 To modernize the tub itself, opt for a jetted tub that all ages will find relaxing. Another option is installing an insert in a tub and shower combo. It allows you to maintain the traditional look of a bathroom without the tripping hazard of a high-sided bathtub. The extras in your space can have a huge effect on your bathroom. That means choosing things like built-in shelves over suction cup shelving, and choosing a luxury shower head instead of a shower head from the bargain bin. The right fixtures can also transform your space. Make sure your space lasts the test of time by choosing the right details for your bathroom. For help choosing the right details for your needs and budget, contact Bath Planet, and we’ll make sure you get a bathroom that will look fresh and new for years to come.